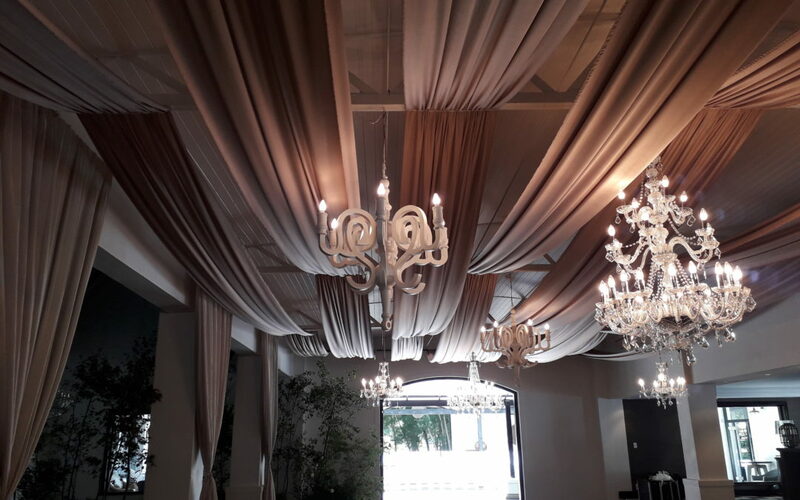 The Events Draping Co. was recently back in the heart of the Stellenbosch wine country at Molenvliet Oosthuizen Family Vineyards, one of our favourite wedding venues. This time we were asked by the first-rate event planners at Molenvliet to drape eight scallops in the ceiling in the main reception area. Using a dark stone-coloured fabric, the series of strips created a lovely full look for the festivities. The draping team then also draped some of the pillars in a curtain effect to complete the overall impact for the celebration.